Groundbreaking Vortex® sawdust-removal bandsaw blade now available from world's leading portable sawmill manufacturer. 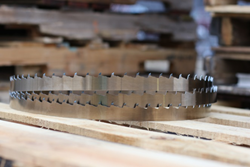 Wood-Mizer's Vortex sawdust-removal bandsaw blade has generated positive results in high-production pallet factory tests. The new Vortex blade does a great job of getting the sawdust off the wood. It’s going to be an asset for companies trying to produce a clean pallet. Wood-Mizer LLC, the world’s leading portable sawmill manufacturer, introduces the groundbreaking Vortex® sawdust-removal bandsaw blade. Available now in North America, Wood-Mizer’s new Vortex® blade is engineered for pallet producers who need boards as free from excess sawdust as possible. The Wood-Mizer Vortex® blade is now available to order in .042 x 1 ¼ at any length. Call 800.522.5760 or visit http://www.woodmizer.com/vortex for more information. Offering more than 60 basic blade profiles and an extensive array of combinations based on tooth profile, width, thickness, tooth set and tooth spacing, Wood-Mizer offers blades for any type of sawing application from softwoods to hardwoods. Order online at http://www.woodmizer.com/blades. Since 1982, Wood-Mizer has earned the reputation as the world’s largest manufacturer of portable band sawmills with tens of thousands of bandmills sold around the globe. Today, Wood-Mizer offers an extensive line of portable sawmills, industrial headrigs, resaws, edgers, kilns, log splitters, material handling equipment, bandsaw blades and blade maintenance equipment for woodworking hobbyists and forestry professionals all over the world. For nearly 35 years, Wood-Mizer has provided top quality wood processing equipment and exceptional customer service for people who want the freedom of sawing their own lumber for projects or production. For more information about Wood-Mizer, call 800.553.0182 or visit http://www.woodmizer.com.